Every now and then, we all get a visit from the Bedhead Fairy. If you have children, you know that bedhead can strike any time, night or day, without even having to see a bed. The next time you’re trying to tame some wild tresses, reach for this DIY detangler! To make things simple, each of these recipes starts with the same conditioning base. All you need to do is add a few drops of your favorite essential oils to this base to transform it into a custom detangling solution that will perfectly fit your needs. Bring the distilled water to a simmer without boiling. Combine the warm water and conditioner in the bottle, shaking to combine. Add the recommended essential oils to the detangling base, shaking once again to distribute. 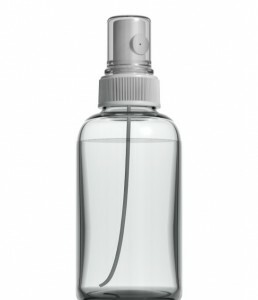 Apply the detangler to hair as needed, using the bottle’s spray attachment and focusing on the ends rather than the scalp, gently combing to dispense evenly throughout your hair. You can either rinse out the detangler or leave it in for extra conditioning. Style your hair as usual and enjoy the pleasant aroma of essential oils throughout the day! What are some of the essential oils you use for hair care? Share your favorite combination below in the comments!